In which Jay draws a line in the sand, Rogue hits someone with a bear, Toad develops nuance, and you should totally come see us at ECCC! You can find our full ECCC lineup over here! NEXT WEEK: Excalibur goes ongoing! In which Beast’s DNA is basically held together with spit and baling wire; Boom Boom wins MVP; Angel goes full goth; Cameron Hodge loses his head; Cyclops is basically a Silent Hill protagonist; and the Nebraska Department of Social Services is probably not adequately equipped to deal with Mister Sinister. NEXT EPISODE: Excalibur goes ongoing! Hang out with us on Imzy! With Emerald City Comic Con just over two weeks out, we figured it was about time to let you know what we’ll be up to, because there’s A LOT! In which it’s pretty much always terrible to be Magik; Y is a sometimes vowel; Wolfsbane is a secret Disney Princess; feelings ruin everything; and Gossamyr may or may not be an allegory (but is pretty interesting either way). In which the parts of Extraordinary X-Men are greater than their sum; All-New X-Men is the new New Mutants; you should totally come see us at Norwescon and Emerald City Comic Con; and yes, we are aware that it should be Luis Buñuel, but it’s been a long week. In which Miles follows his heart; subtext becomes text; and we celebrate a very special milestone with a very special guest. For a comprehensive visual companion to this episode, we recommend reading Uncanny X-Men #94-279, 381-389, and 444-473; X-Men vol. 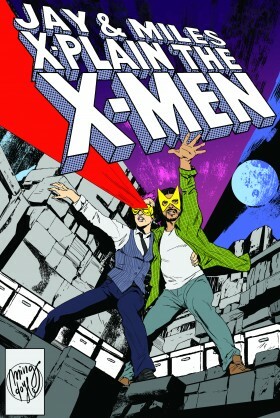 1 #59; X-Men vol. 2 #1-3, 100-109, and 165; New Mutants #1-54, 63, and 81; Excalibur vol. 1 #1-19, 21-25, 27, and 32-34; X-Treme X-Men #1-46; X-Men Forever #1-25; and dozens of additional annuals, miniseries, ongoings, one-shots, graphic novels, and more.